Great Lakes has a wide variety of accessories to support your current, planned and future needs. Let us help you"Future-Proof"
Download the Cooling Solutions Brochure! 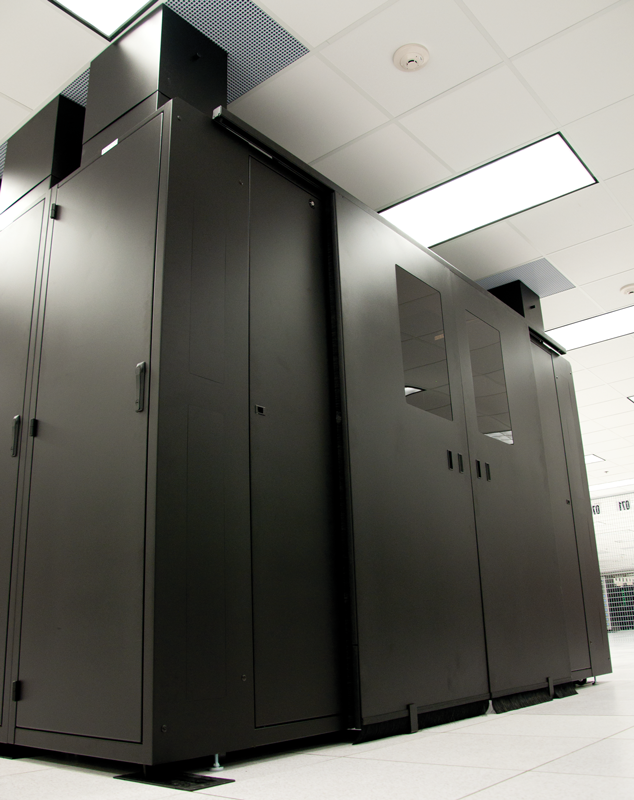 any changing or evolving requirements you may face during the entire life of your data center. 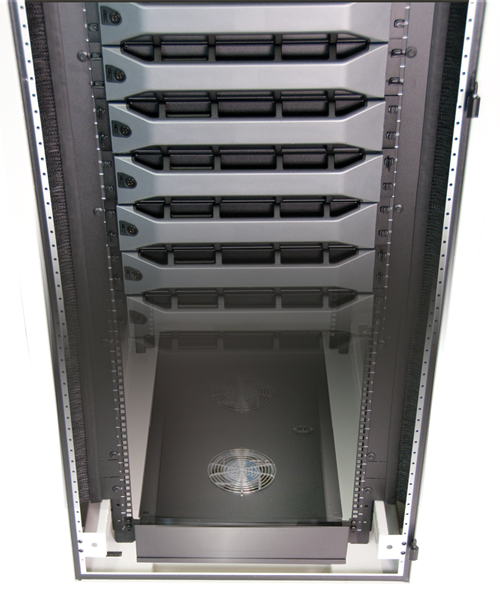 Backed by our 25 years of experience in enclosure engineering and manufacturing, the Great Lakes ES Server Enclosure and its diverse portfolio of accessories is engineered to make it easy to mount, connect and network electrical and data communications equipment from any manufacturer within and between the enclosures installed in a data center. 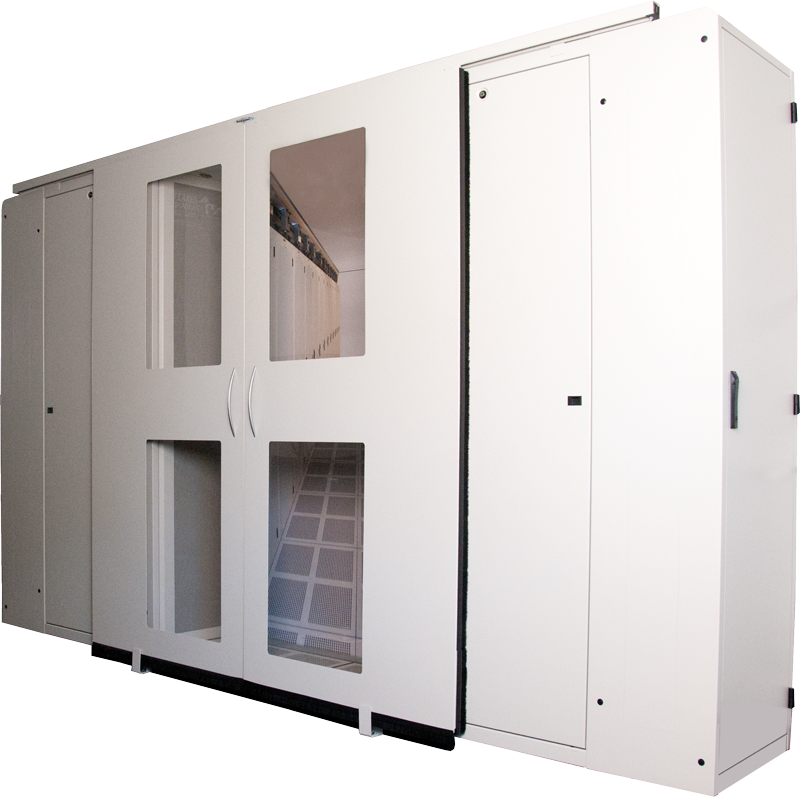 From this single enclosure platform, you can move from a low density application where you may only deal with a load of 4-8 kW to a high density configuration where you may be relying on additional accessories or an outside cooling source to handle a load, perhaps in excess of 30 kW. 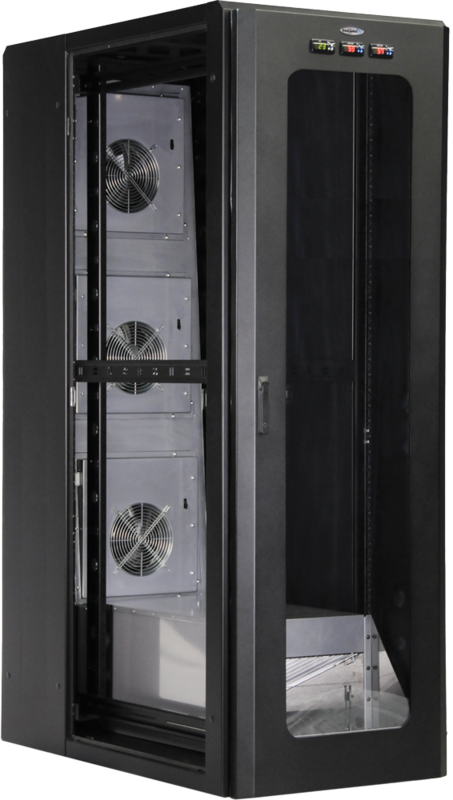 The ES Series enclosure is designed to help you increase the cooling capacity of your data center while increasing your CRAC (Computer Room Air Conditioning) unit efficiency. Great Lakes' EIA (Electronic Industries Alliance) rails found in the ES Series Enclosure are #12 gauge steel, formed three times for added strength. The rails of an ES enclosure can support 907 kg. of equipment and accessories. Our proprietary Flexible Mounting Profile (FMP) is a series of holes along each ES rail, positioned at one- RMU increments, outside of the standard pattern for EIA 310-E compliant rail mounted equipment. We've created a number of accessories to mount vertically to rails without sacrificing valuable rack-mount space. "Zero-U" brackets easily attach to the FMP, to mount any 19" EIA equipment such as cable managers and power strips. Copper bus bars, cable management fingers, and other accessories also mount to the FMP. 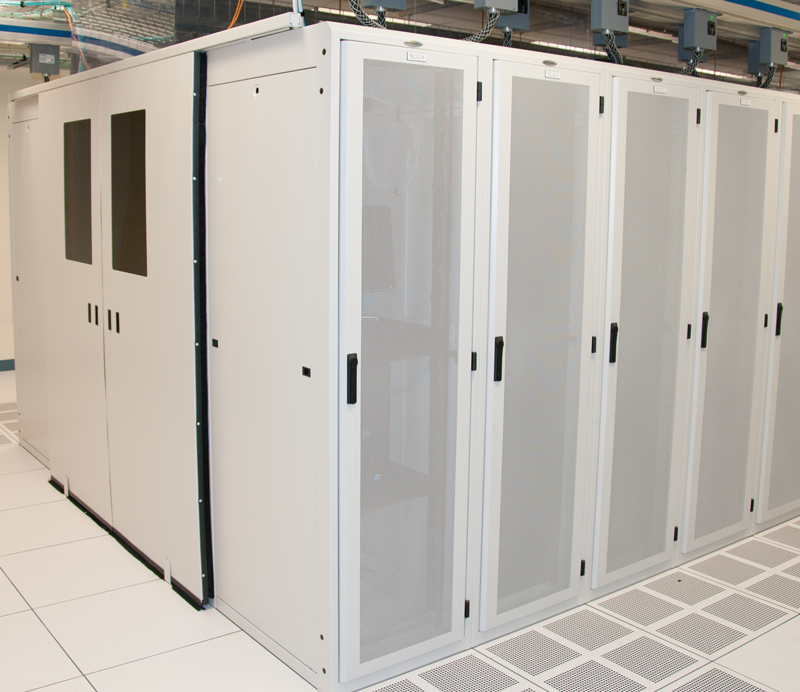 From cable troughs and ladder rack brackets, exhaust chimneys, air managers and fan assisted doors, to a closed-loop water-cooled enclosure kit, Great Lakes' portfolio of enclosures and accessories is designed to support any changing or evolving requirements you may face during the entire life of your data center. 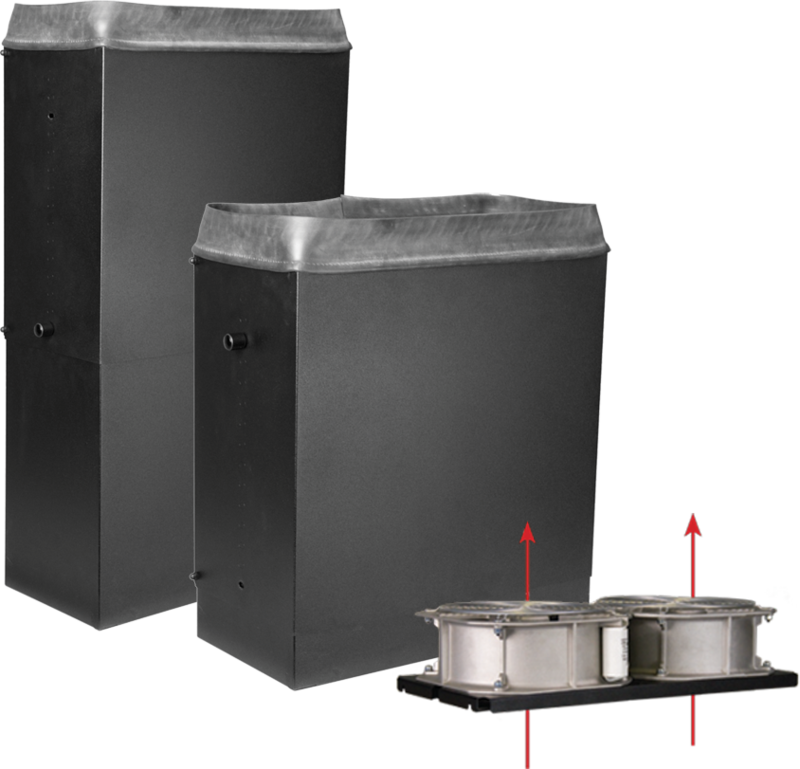 Together, the Adjustable Air Manager, the Exhaust Chimney and the Brush Grommet Kit work to contain conditioned air and remove heated exhaust from the enclosure, while virtually eliminating bypass airflow and hot air recirculation. We call this solution "Localized Containment" (eliminating the hot aisle and reducing the need for perforated tiles in the cold aisle). The Exhaust Chimney (GL-EC) helps to remove heated exhaust far from the enclosure or, more efficiently, to collect heated exhaust into ducting or a ceiling plenum to return it to the CRAC unit. 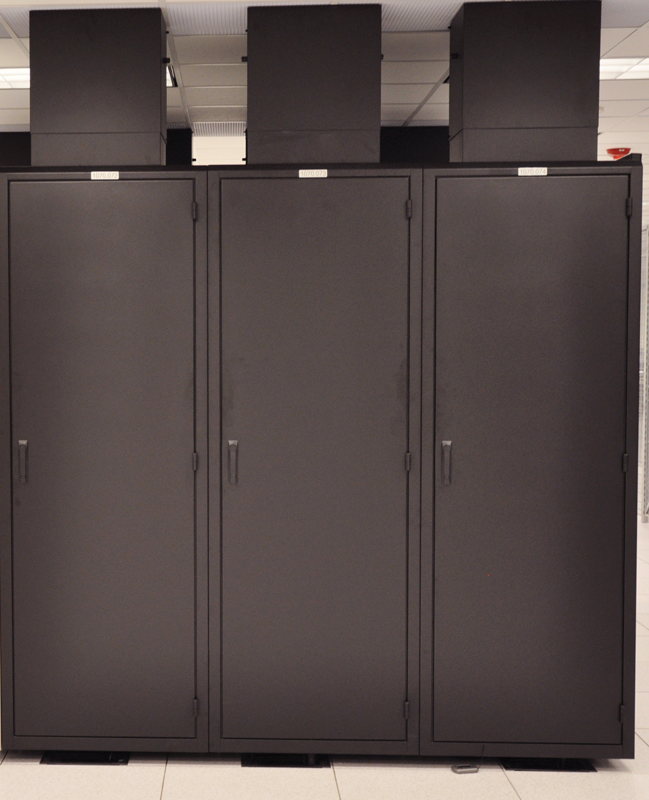 The Adjustable Air Manager (AM-ES) mounts in the bottom of a Great Lakes ES enclosure (on a raised floor) to bring data center conditioned air inside the enclosure closer to the equipment to be cooled. A simple slide on the Air Manager allows you to control the flow of conditioned air coming into the bottom of the cabinet. This increases air flow, lowering temperatures in the front of the equipment while maintaining air pressure. The Brush Grommet Kit (BGRK) installs between the rail and the side panel to allow cable passthrough while at the same time eliminating bypass air flow and hot air recirculation. 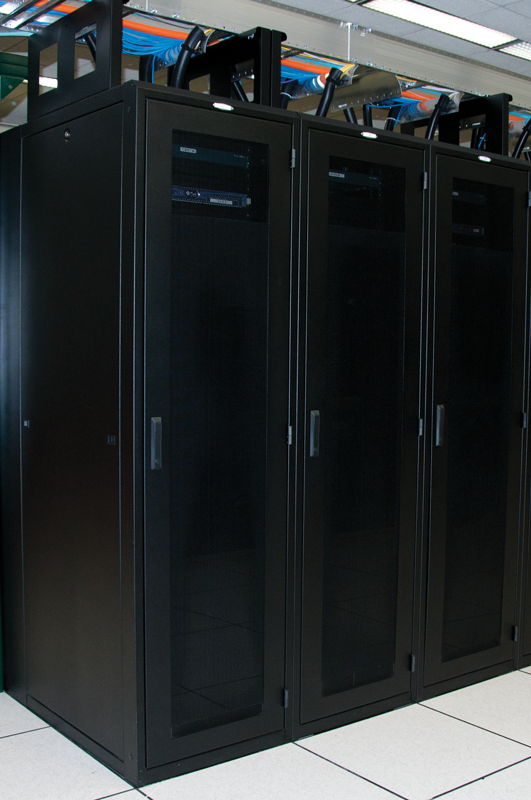 Localized Containment can be Passive or Active, depending on data center infrastructure and conditions. 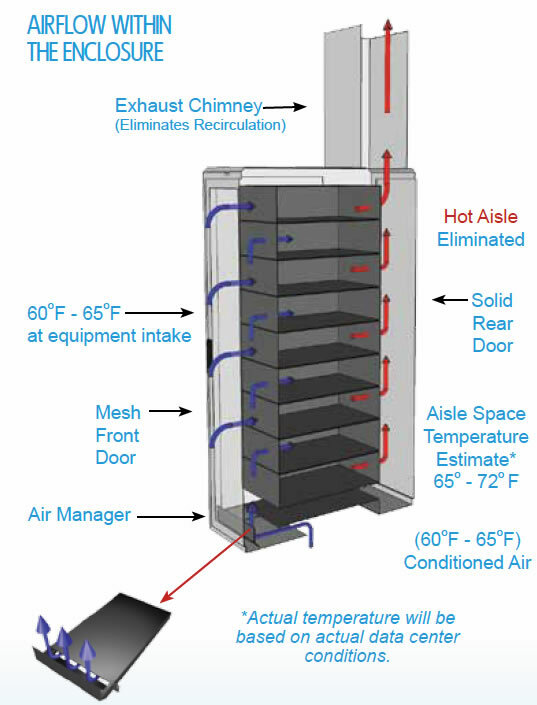 Localized Containment moves the cold aisle (via the Air Manager) and the hot aisle (through the Exhaust Chimney) into the enclosure. 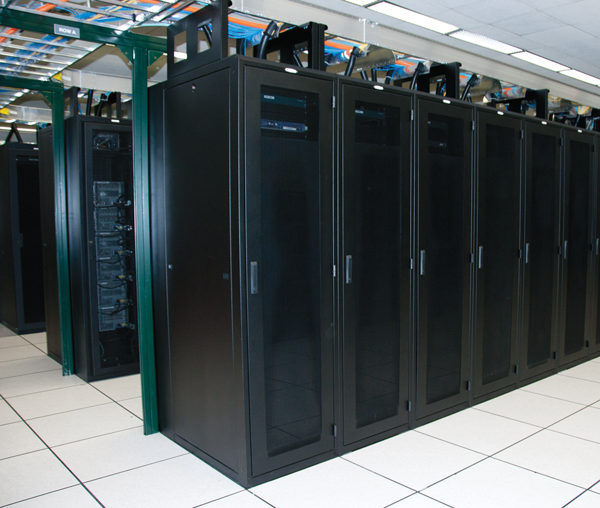 Depending on your data center's infrastructure, the delivery of conditioned air and your desired strategy for handling the return, your solution can be passive or active. 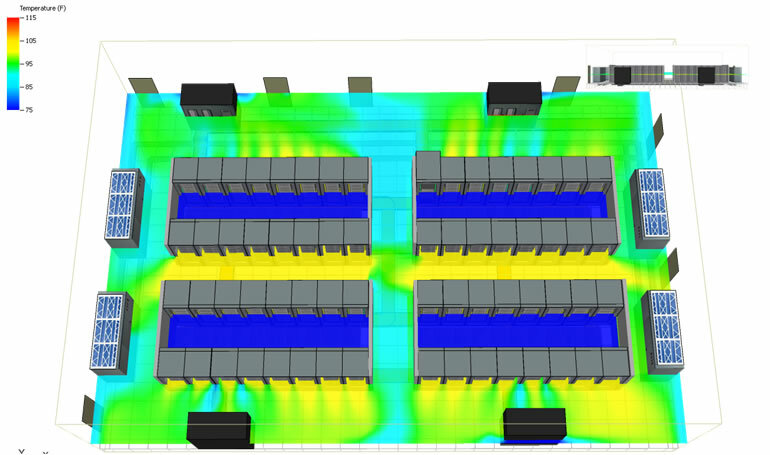 Many times a data center's air conditioning/handling systems create airflow under the floor. In this circumstance, the Air Manager and Exhaust Chimney provide localized containment of the conditioned air within the front of the enclosure and extraction of the heated exhaust on their own, without the aid of fans. The opening on the Air Manager is 100% adjustable with the use of a simple slide to maintain static pressure and to accommodate for the amount of air available to each enclosure. 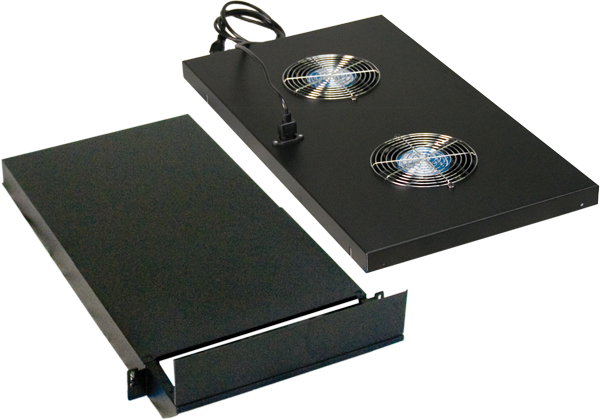 If static pressure or air flow is too light, Great Lakes offers fan trays for the Air Manager and Exhaust Chimney in the ES Series enclosure which deliver conditioned air within the front of the enclosure and accelerate the removal of heated exhaust. The slide on the Air Manager can still be adjusted in any enclosure to ensure optimal conditions can be met, based on available ambient airflow and static pressure. Great Lakes also offers High Flow options for the most challenging raised floor conditions or for use in certain slab floor environments to further accelerate the air flow under the enclosure and the removal of heated exhaust. In these circumstances a source of conditioned air must be available and the enclosures must be on casters or levelers to create a pool of cold air under the enclosure from which the Air Manager may draw. 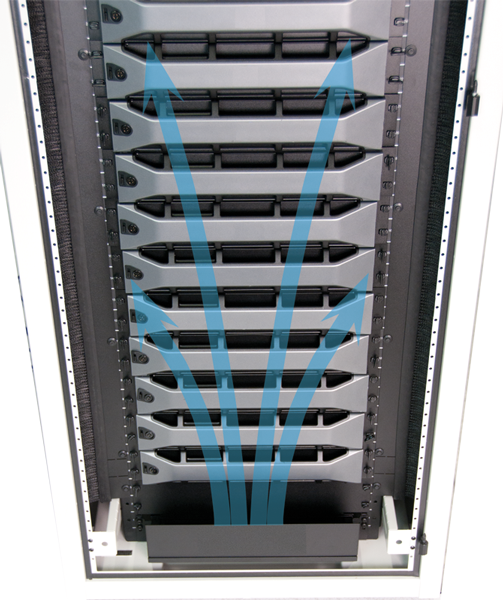 The Great Lakes Closed-Loop Water-Cooling System, developed in conjunction with Naissus Thermal Management Solutions, addresses the primary challenge faced by data center managers today. 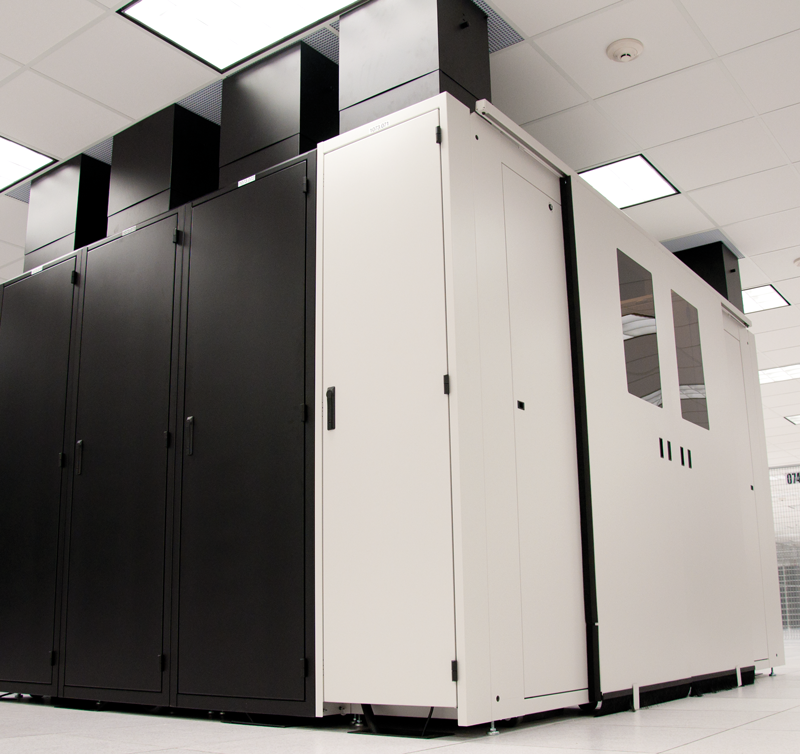 As smaller, more powerful servers are compacted into higher density configurations, data center and air conditioning systems must expand to provide sufficient cooling air. 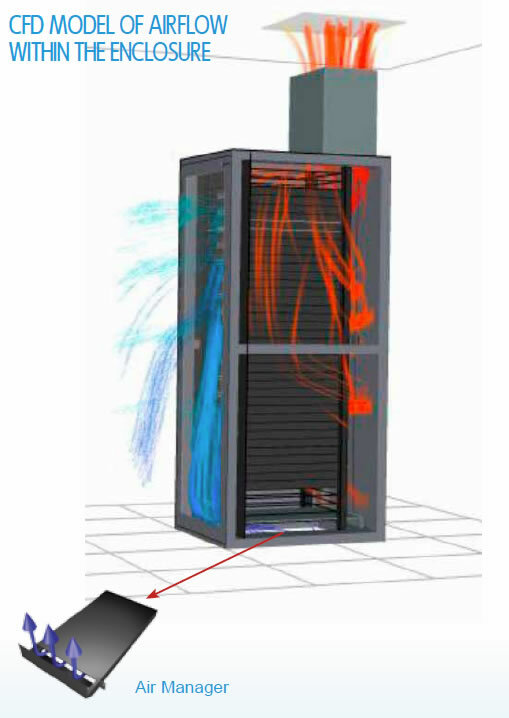 Even with costly floor space and air conditioning additions, data centers still struggle with uneven cooling and hot air recirculation resulting from heat exhaust traveling from other enclosures. The Great Lakes Closed-Loop Water-Cooled Enclosure (CLWCE) provides an integrated closed-loop cooling system, saves on floor space, power consumption and maintenance. 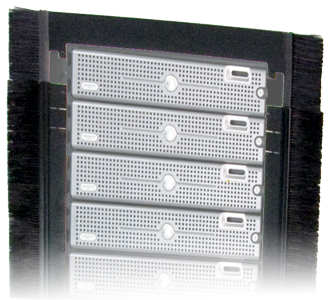 It also seals servers from re-circulated exhaust, becoming a versatile high-density solution to today's data center challenges. 1. 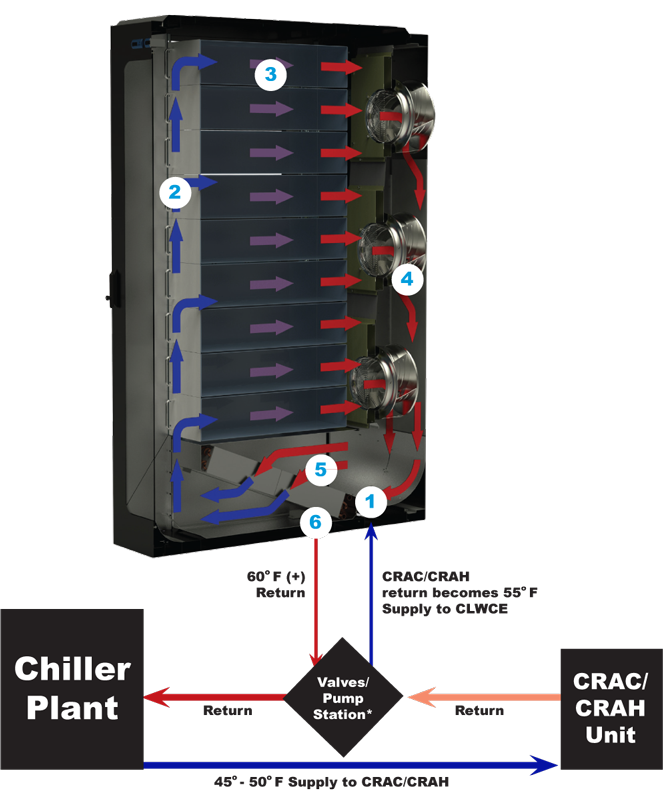 Chilled water at a consistent temperature and flow rate directly from a viable source or via a coolant distribution unit (CDU) enters the heat exchanger coil, cooling air as it passes over it. 2. Conditioned air at consistent pressure is directed through a plenum chamber. 3. 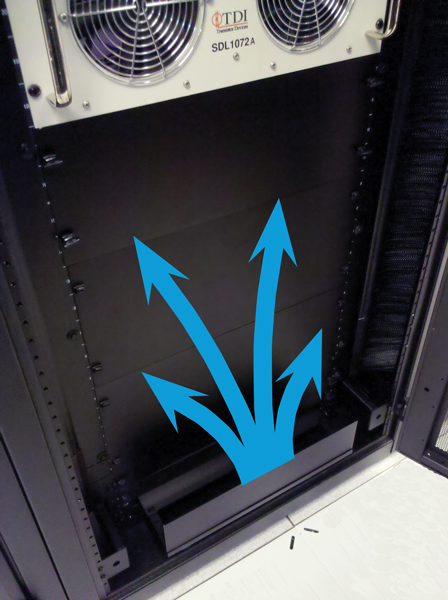 Conditioned air passes through rack mounted equipment. 4. 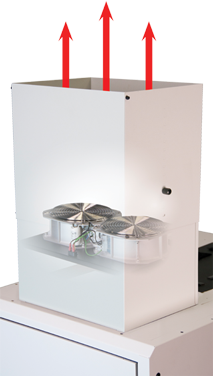 Quiet (65 dB) high efficiency variable speed exhaust fans remove hot air. 5. Hot air passes across the heat exchanger. 6. Water then leaves the heat exchanger coil to begin a return trip to the chiller. - Empty weight: 386 kg. - Shipping weight: 409 kg. - Static load: 907 kg. 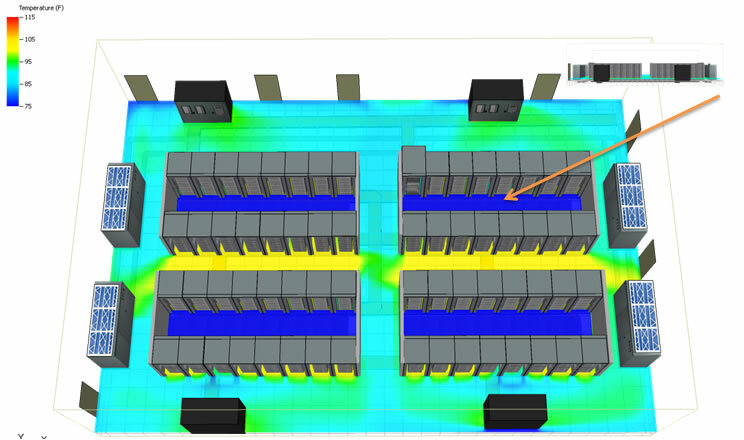 Many times cooling challenges cannot be met simply by expanding infrastructure or adding additional CRAC units. 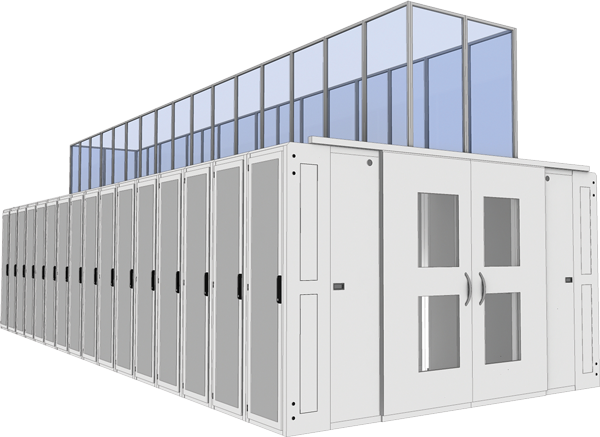 The strategy behind containment is to either capture as much conditioned air as possible or to isolate and remove as much heated exhaust air as possible within the data center space. Download Great Lakes' guide to Containment Solutions! Ducting the exhaust with chimneys creates a simple version of hot aisle containment. The hot aisle is now contained locally in the rear of each enclosure. The doors create a defined space, either isolating exhaust or creating a concentrated area of conditioned air which enhances the cooling effect on the enclosures within the contained space. Can be used in aisle widths from 48" to 72"
In addition to containment doors, there are a number of containment products, including PolarPlex, which can be deployed in a variety of strategies. 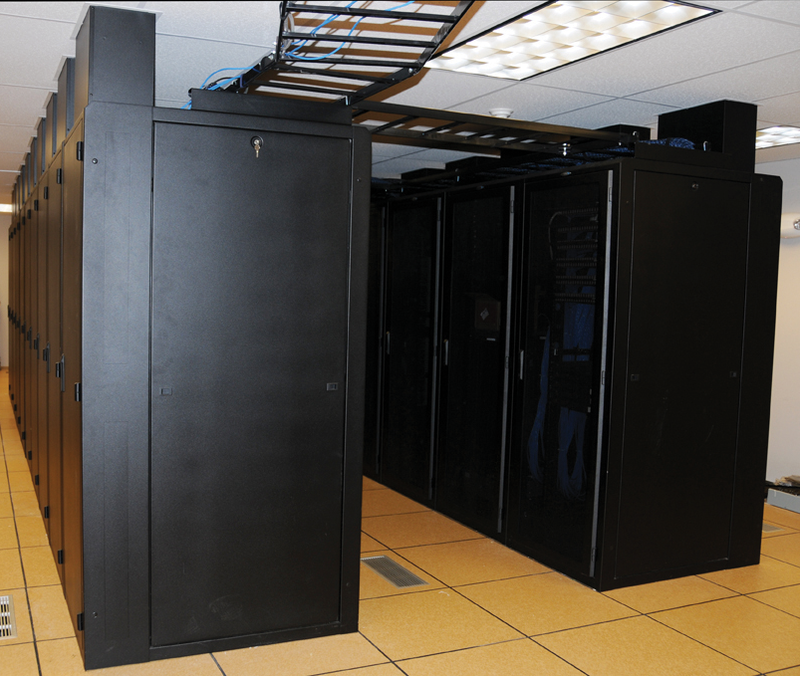 In this example, the customer chose to employ a data center solution designed to contain the hot aisle. Perforated tiles were installed in the cold aisle. The conditioned air then passed through mesh doors to cool the equipment mounted within the enclosures. The customer chose not to use any rear doors, so heated exhaust was simply vented into the hot aisle which was contained by aisle doors. 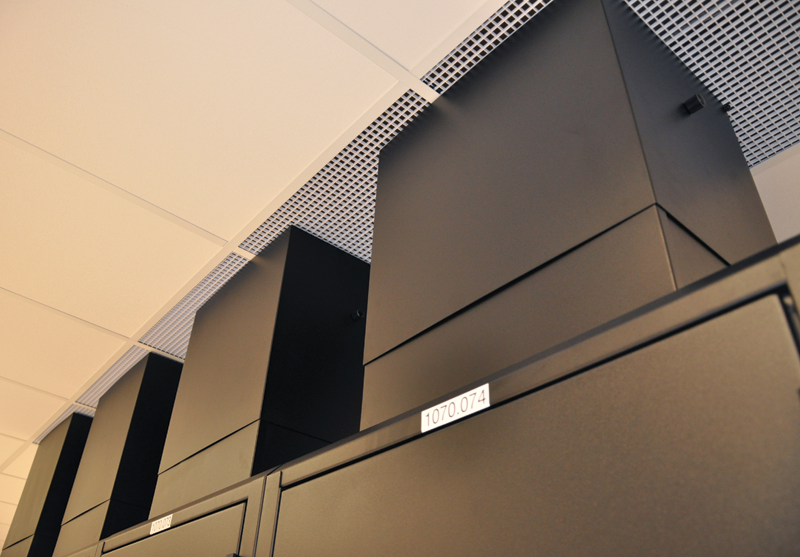 Vertical thermoplastic containment panels were attached to and installed above the enclosures to continue the containment process as the heated air naturally rose and was channeled to a drop-ceiling plenum which then directed the heated exhaust to the hot air return of the data center's CRAC units. then designed to isolate the cold aisle in this grouping of enclosures. The goal for this strategy is to saturate the area in front of the enclosures with this contained conditioned air and to focus it where it is most needed; in front of the equipment mounted within the enclosures. Once the conditioned air passes through the equipment, the heated exhaust is then removed from the rear of the enclosures via Exhaust Chimneys. Computational Fluid Dynamics (CFD) modeling uses computer calculations to simulate the interactions of liquids and gases with various surfaces in a defined space. 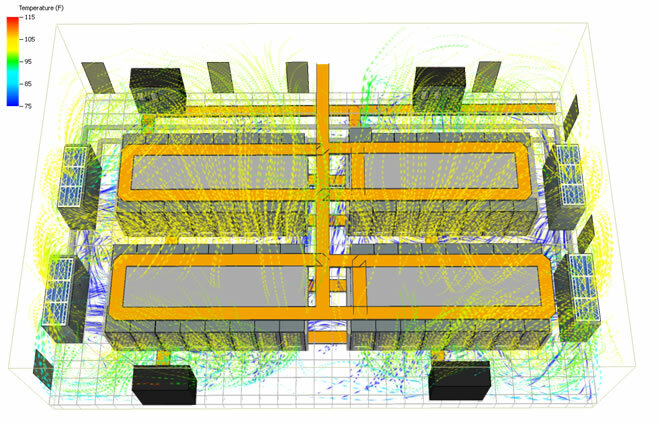 To better understand the role the enclosure plays in the operation of the data center, Great Lakes has developed the capability to perform CFD analysis with data center specific software. We are now able to help customers to better understand what is currently happening in their data center environment, to test or plan capacity increases or, to test a data center, room or pod design before ever starting a build. To learn more about Great Lakes' CFD capabilities, to contract Great Lakes to perform a CFD analysis on your facility, to investigate the impact of planned changes to your facility or to investigate a new design to a future facility, please contact your Great Lakes sales representative. 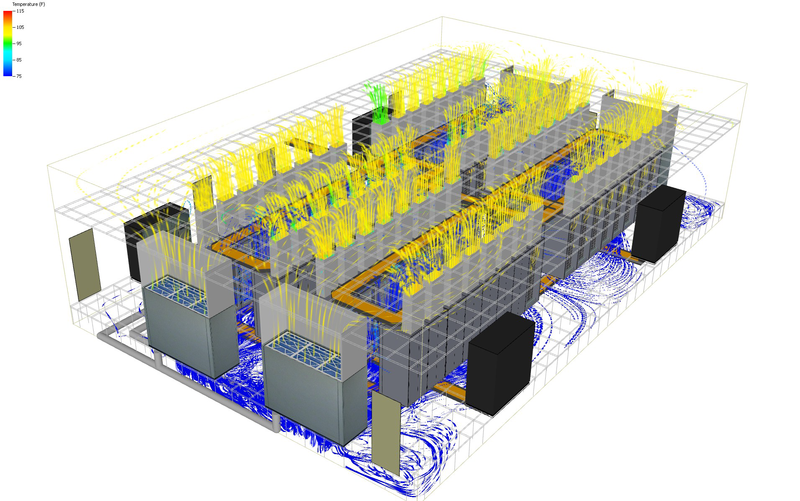 Download CFD Models of Great Lakes' Containment Solutions! 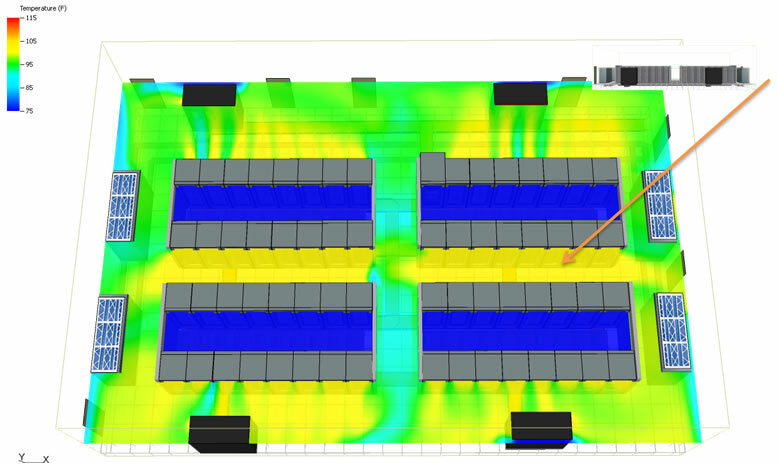 Top view of cold aisle containment with horizontal Polargy panels. 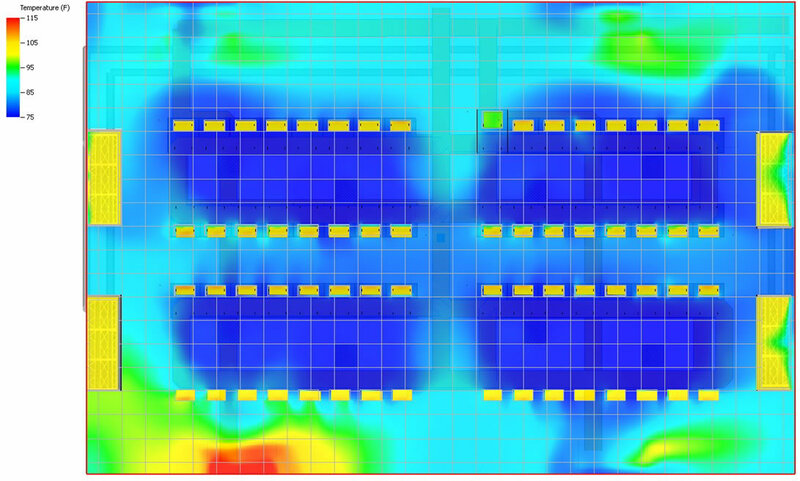 Overhead containment panels reduce recirculation in the top of enclosures creating very consistent temperatures in the aisles of the data center. Equipment intake temperatures are consistent from top to bottom. Overall, the system is efficient in segregating hot air from the room providing a high return temperature to the CRAC unit. However, end of row doors and overhead panels add additional infrastructure and safety considerations.